PhotoWhirl is a free photos app for Windows 8. 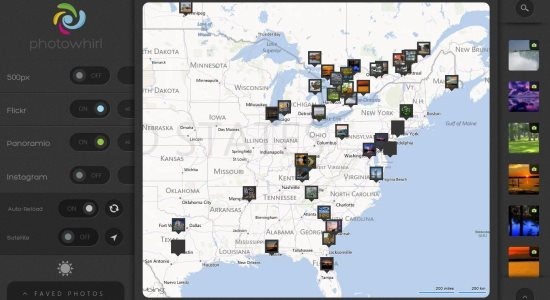 Using this app you can search for photos from around the world on a map (supported by Bing). The photos are supported by various services like: Instagram, Flickr, Panoramio, and 500px. This app is a feast for those who love to view photos. This app needs internet connection and it’s just 1MB download size. 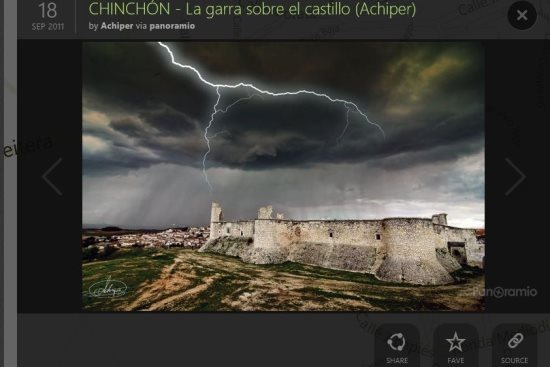 PhotoWhirl is a photos app; using which you can view photos posted by people from around the world. All the photos in this app are geotagged; so they are placed appropriately on the map. All the photos are copyrighted by their owners also. So just enjoy viewing the photos that are posted by people from around the world and explore the world sitting in front of your Windows 8 device. As soon as the app is launched, you will find the interface as shown in above screenshot. On the left you can enable and disable your favorite photo services like: 500px, Flickr, Panoramio, and Instagram. You also have the options for: reload and satellite enabling. 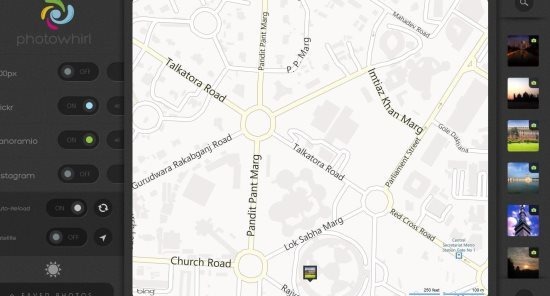 On the right side of the interface, you can view the thumbnails of the photos that are available on the part of map, visible in the app. Just use the mouse scrolling gesture to zoom in or out and left click to view the photos (as shown in below picture). Below the picture you can view the options like: share, fave, and source. Using these options, you can share the photos with others, mark pictures as favorites, and view the source of photos (the photo service through which the photo is posted). You can view all the photos that you have marked fave at one place. You can also set sunrise and sunset alarms using this app. You can locate the geotagged photos from: Instagram, Flickr, 500px, and Panoramio. You can sync your favorite photos across all your Windows 8 devices. Set alarms for Sunrise or Sunset notifications. Use this app in Snap View also. You can browse the world map also (as shown below). You can find this app in Photo category of Windows Store. Open this link your Internet Explorer of Windows 8 and click view in windows store option. After the app opens automatically in the app store, install it from there. Also try these other photos app for Windows 8: Photo Studio and My life in Pictures.